These are the best, instrument-maker tested, low-priced systems and accessories I've been able to come up with for controlling the humidity in one room, such as a music studio, instrument making studio, instrument storage room, practice room or hotel room. Oddly enough, after recalibration, these cheap looking things are much more accurate than any of the "certified, lab-grade" hygrometers I have tested. They are 4x2 inches, 3/8 inch thick and will fit in almost any instrument case. They have a memory function so you can check what the highest and lowest temperature and humidity have been. Accurate measuring range is 30 to 70%, guaranteed to be with 1%. 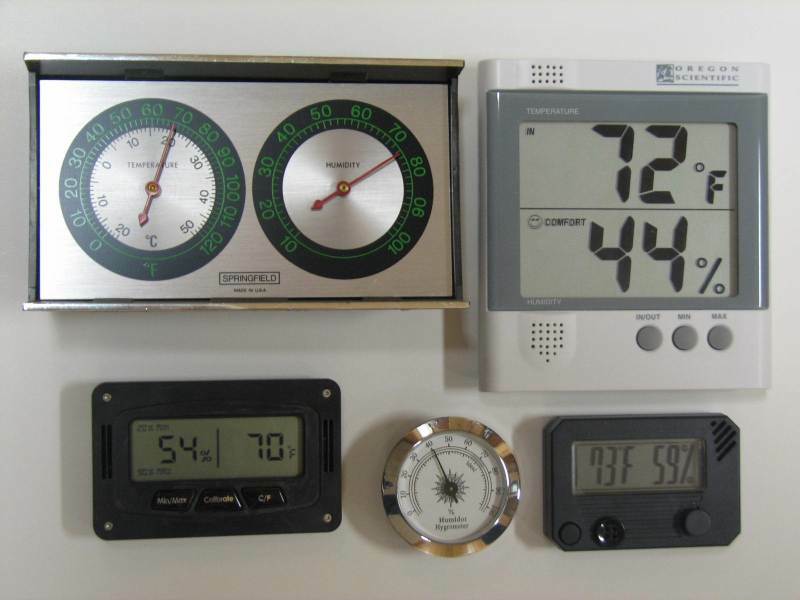 A hygrometer which isn't accurate is worse than useless; it's a hazard to your instrument! Can you find this cheaper? Probably. What's the difference? The difference is that we individually test and calibrate each unit before we send them out, calibrating to provide the greatest accuracy in the 40-60% range (the range typically recommended for stringed instruments). So you can be sure that you aren't getting a defective unit, and you don't need to calibrate the unit before use, as the manufacturer instructions recommend. It's already been done, in one of the most accurate possible ways. Note: This hygrometer should NOT be calibrated using the "salt test" method described elsewhere on my website, and doing so will void the manufacturers warranty. Why do you need this separate controller? When the controls for humidifiers and dehumidifiers are built into the appliance, they tend to sense the moisture and heat in the appliance, rather than what is in the rest of the room. The result is that their precision goes a little berserk, and my tests have shown humidity swings as high as 30%. This unit can be located many feet away from your appliance. Will automatically turn both humidifiers and dehumidifiers on and off. Will control the recommended vaporizers and dehumidifiers, and many other humidifiers and vaporizers (if they don't lose their settings when power is interrupted). Will control the moisture level much more accurately than most built-in humidifier and dehumidifier controls. Allows the use of inexpensive, bacteria and mold free steam vaporizers such as the one below. The spread between "on" and "off" can be set wherever you want (I recommend 5%) to prevent electricity wasting frequent cycling of the appliance, and the accuracy is superior so the appliance will run no more than necessary. This setup should pay for itself with reduced power consumption, and by allowing the use of cheaper humidifiers/dehumidifiers. It has all sorts of bells and whistles, like high and low humidity alarms, but be forwarned that they are rather complicated to program. However, I include simplified basic programming instructions, which no one has had a problem with so far. Note: Will not work with appliances which have controls which need to be reset if they have been unplugged. These controllers can sometimes be found someplace like Amazon or Ebay for less than I sell them for. But be careful to order the humidity controller, and not the temperature controller, since the appearance of the two is identical, and the temperature contoller is much less expensive. I offer these to people who place a higher priority on getting a system up and working, than noodling around on the internet, or the complications and delays of ordering a product which is shipped from China, or from a seller who furnishes no contact information. My phone number is (734) 668-7803. I may offer a pre-programmed option in the future, depending on the feedback I get. Everything is a work in progress. 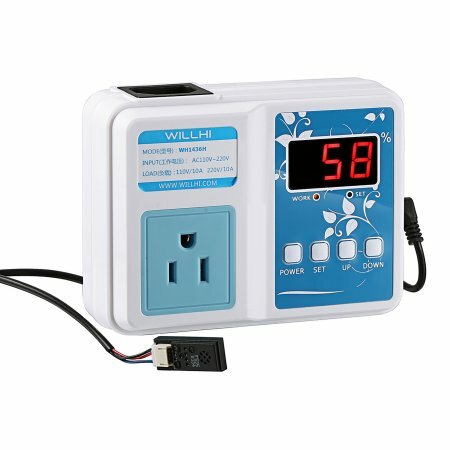 This performs much the same function as the Willhi unit above, but is much easier to use (doesn't require the complicated programming). However, it is not as accurate, has far fewer features, is much more expensive, and should be set using an accurate calibrated hygrometer, since the settings marked on the dial can be way off. Note: I will no longer be carrying these. At one point, they were by far the best product on the market, but I no longer feel that way. Another control unit, but this one only works with humidifiers, and is less expensive than the Greenair. If you only need to humidify, this is excellent for controlling one of the recommended inexpensive Sunbeam steam-type vaporizers, which doesn't have any controls of its own. Simple to use. Plug it into a grounded outlet, and turn the dial until the desired humidity shows in the display window (after ten seconds, the display will automatically switch back to showing the level in the room). Plug your vaporizer into the receptacle on the front. This control unit, combined with one of the cheap vaporizers (I don't carry the vaporizers, because I can't supply them for any less than what you can find on Amazon), will give you an excellent, instrument-maker tested, low-maintenance-cost humidification system for only about $80. It will maintain it's settings after power interruptions, and will keep the humidity within a narrow range, about 2%. The accuracy of the digital display was pretty good on the first few batches I purchased, but other batches haven't been so good, so now I recommend using a calibrated hygrometer to determine the actual setting. Beginning at the upper left corner, they read 75, 44, 54, 40, and 59 percent humidity. These were all photographed at the same time, in the same environment. The one on the lower right is the one with the correct reading. The one on the lower left is another brand which can be calibrated, and I tested it because it looked promising. Immediately after calibration, it was pretty good, but several months later, it ranged between 5 and 9% off. Recommended Sunbeam Vaporizer, 1.2 gallon capacity, model 1388. Emits bacteria free, mold free, mineral free distilled steam. Has no wicks or filters that support bacteria or mold growth, and which will need to be replaced periodically (and it's cheaper than anything else!). If it gets mineral buildup after a couple of years, just throw it away and buy a new one. I got about six years out of my last one. 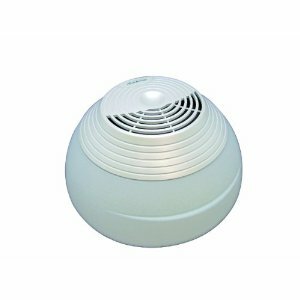 Since it has no fan, it is also quieter than many humidifiers, making only a bubbling sound like boiling water. Plug it into one of the control units above for automatic operation. I don't carry these, but wanted you to have a picture of what you'd be looking for, since the Sunbeam unit is currently hard to find in stores and may need to be ordered online. Similar steam units from Vicks are available at K-Mart, Meijers, Walmart, and similar places, usually under $20 in the health products department, but my experience has been that the Sunbeam #1388 emits the most steam and lasts the longest. The Vicks is quieter. Need to humidify, but it's already hot and you don't want to add any heat? Try the Hunter model 33201, an evaporative style which doesn't need replacement filters. The downside is that it is much more expensive than the steam vaporizers, and has an internal fan, making it noisier than the steam type. Recently available at WalMart. Frigidaire Energy Star 30 pint-per-day dehumidifier, product #FAD301NWD, about $170 from walmart.com, or from various other internet sources. I'm currently using this with the separate "universal control unit". Some other dehumidifiers I have tested have failed rather quickly. It maintains its settings despite power interruptions. It has provisions for a drain hose, so one doesn't need to empty the reservoir if there's a drain nearby, at a lower level than the dehumidifier. It's a little noisy, but one can unplug it for practice or lessons, and it will retain the settings upon plugging it back in. Just don't forget to turn it back on. Dehumidifiers aren't quite the electricity hogs that they once were. But as efficiency has gone up, the heat exchangers have gotten thinner, and more prone to leakage. So I'd pay a little more, if necessary, to purchase from a local store which will exchange it if it fails within the warranty period (or will do so if you buy their "protection plan"), so you wouldn't need to deal directly with the manufacturer if it fails, which can be a nightmare. The much more expensive dehumidifiers don't seem to have a track record that's any better. We don't carry these because of the expense in shipping, but they are Energy Star rated, inexpensive, and have good consumer reviews. Their down side? As with many dehumidifiers, the built-in controllers resulted in quite a fluctuation in room humidity. No problem. 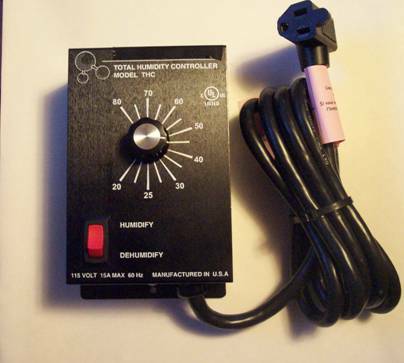 Plug them into one of the dual-purpose humidity control units higher on the page.